Each adult needs varying amount of sleep, which will depend on a variety of factors, such as age and health. Generally speaking, however, experts recommend that you should have at least seven to nine hours of sleep per day. If you are not getting enough sleep, you are most probably suffering from sleep deprivation. It is a condition that is prevalent in at least one in every five adults. It can be caused by a variety of factors, such as lifestyle, behavior, work, medical problems, and external environment. It can lead into excessive sleepiness, drowsiness, lack of productivity, anxiety, making poor decisions, high blood pressure, and irritability, among others. 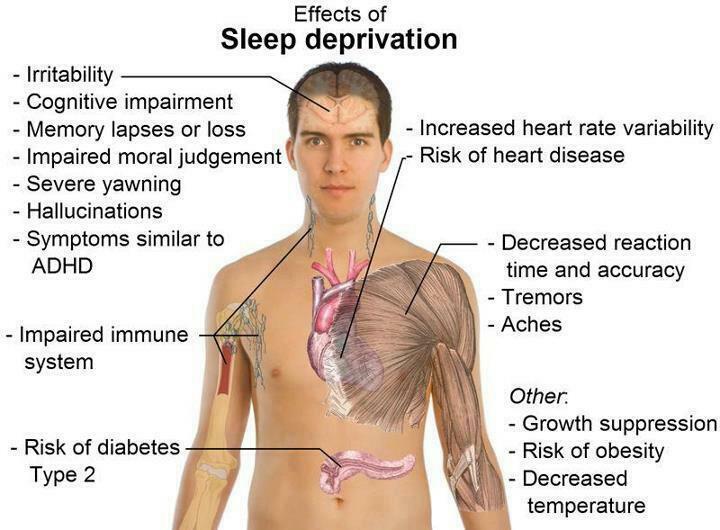 Are you suffering from sleep deprivation? You should not be left guessing. Keep on reading and we will have a quick look at some of its symptoms. You have already eaten tons of food, yet you still end up feeling hungry. This is one of the most common signs that you are sleep deprived. Sleep will supply the energy that is needed by the brain. If this cannot be supplied by the brain, food will do the job. When you have minimal sleep, chances are, the body will increase the production of ghrelin, which is considered as a hormone responsible for hunger. This hormone will lead into craving for sugary and fatty foods. Ever noticed how you have gained extra pounds in the past few weeks? One thing that you can blame is sleep deprivation. This is related to the symptom that has been earlier mentioned. When you are hungry, you just tend to eat almost anything that you see, including junk food. You become less intelligent when it comes to food choices. This, in turn, will have negative impacts on your health, specifically in terms of weight. In addition, lack of sleep can also make your metabolism slow. Lack of sleep will lead into clumsiness. In some instances, you may not even know what you are doing. You are lost. You cannot concentrate. You might end up spilling milk when having it poured. You can be tripping more often. Your reflexes may be impaired and your focus will be affected. You cannot react quicker to the things that happen. There is always sort of delayed reaction on your end. Your memory will also be greatly affected if you have sleep deprivation. If you keep on forgetting things, such as what you plan to do for the entire day, this is one of the most obvious indications that you are in need of more sleep. When you are tired and sleepy, you are most probably not paying full attention to different things, which is exactly the reason why you tend to be more forgetful. Whether it is as simple as deciding where to eat or something that is as complicated as making a business-related decision, you will find it hard to do so when you are sleep deprived. Your cognitive processing, including speed, can be negatively affected. You might be distracted and your brain may not be fully functioning. When you make decisions, you might risk the outcomes. It can be an uninformed decision. Sleep deprivation can negatively affect your health, as it has been earlier repeatedly pointed out. This will make you prone to viral infections, and hence, there is a higher likelihood that you will be able to catch cold. Several studies in the past have actually proven that the less sleep you have, the more likely you will be having colds. When your emotions are out of control, you may be suffering from sleep deprivation. In one instance, you may be happy and laughing. Before you know it, you are already crying and you start to be emotional. Even the smallest things can make you sad and will make your tears fall. Anger, anxiety, and sadness can be provoked even by things that do not actually matter. When you are tired and sleepless, the muscles in the eye can be harder to control. This causes blurry vision, which can be dangerous if you will be engaged in some activities, like driving. Skimping an eye is common, you might be blinking more often, and in some instances, you will be uncontrollably closing your eyes for an extended period. Double vision can also be an outcome of sleep deprivation (Source).